I’m here to tell you about the Carnival Sunshine cruise ship. We sailed on the Carnival Sunshine out of the Port of Charleston, South Carolina. It was a seven day cruise to Grand Turk, Amber Cove, and Half Moon Cay. This was the first time we had sailed out of a port other than Galveston, and let me just say, if you have the opportunity to cruise out of Charleston, the experience for embarkation was so smooth and very easy. But, that is another story for another time. The Carnival Sunshine was my very favorite ship to sail on, so far. The other three ships we have been on include the Carnival Triumph, the Liberty of the Seas (Royal Caribbean), and the Carnival Freedom, in that order. The Sunshine is roughly about the same size as the Carnival Triumph, and smaller than the Freedom, but it definitely holds the biggest place in my heart. (Per Carnival Website) Just to give you an idea measurement wise. I’m not sure why this ship seems so much bigger to me, but I loved everything about this ship! The layout, the new amenities it offers, even the fun squad was great. The Serenity Deck was probably my favorite part of this ship. I loved that it was housed on three decks, that all looked out over the Lido deck. There was something about being in an adult only area, but still apart of the fun, that really appealed to me. We could easily still watch the competitions and happenings going on down on the Lido deck, but still enjoy the amenities that the Serenity Deck has to offer. With that being said, there was plenty of space away from all the excitement of the Lido, to get some actual Serenity as well. They had their own pool as well as their own hot tubs, which I appreciated, because in most pools there are kids running and splashing around. That’s great that they are having a good time, but sometimes you want to just sit and enjoy the pool without being splashed or having lots of screaming. I will say that there never seems to be enough chairs anywhere on the ships, though. They have started implementing the empty chair rule, that if it is left unoccupied for more than 30 or 45 minutes, your stuff will be removed. While it’s helpful, as I will watch that chair, it shouldn’t be necessary. Side note, I almost got into it with this group of ladies over some Serenity Deck chairs. It started pouring, and everyone scrambled, grabbing all of their things and leaving their chairs completely empty. Well, once the rain was gone, I sat my happy booty in a chair that was COMPLETELY EMPTY, and started to enjoy the break in the rain. (See picture below for said chairs) This lady had the nerve to ask me to move down the row because her friend was sitting there before the rain came and that it wasn’t fair that she should lose her seat. Now look, I made sure to sit in an empty chair, not the ones next to me that did still have things in them. But hey, whatever. I put a smile on my face and moved down as to not make a big deal about it. So all her friends came back and sat down, and she then proceeded to talk about me as if I wasn’t still sitting there, looking straight at her. Then looked over at me and said “You didn’t mind, did you? You still have a seat.” But whatever. Its vacation, you will not ruin this for me, lady. Back to the Serenity Deck, I enjoyed he bright turquoise chairs and sunny yellow umbrellas, the palm trees and the little covered round chair things. It was all very relaxing and it quickly became my favorite place to be. Another thing that I have found is really nice about this ship, that was also similar to the Liberty of the Seas (RC), is that it did have the Water Works splash area for the kids. It gave them a special place to go and have a good time, leaving fewer of them running all over the ship. ***Disclaimer: I don’t hate children, but I do feel like sometimes they get a little out of control on the ships, and they aren’t being supervised by their parents, which can cause some annoyance to other cruisers, such as myself**** This ship included the sky course, which was not on either of the other Carnival Ships we have been on before. I did not bring a single pair of closed-toed shoes, apart from my high heels, so I did not get to participate in the Sky Course. However, Tanner did once and it looked like fun. I think the SportsSquare is an awesome addition to the ships and offers lots of fun things to do for everyone, not just for the kids. There was a basketball court, foosball tables, super fun plastic chairs to sit in. There was of course the mini golf course and there was a huge Twister mat painted onto the ground as well as a chess board. There is so much fun happening up there! The Lido Marketplace was different on this ship as well. I really liked the different seating options it has. For instance it has raised benches against some of the interior walls at you enter the market place that had raised tables and looked out towards the windows. That was a unique feature that I particularly liked. It had a Pour your Own Beer station, but it does charge you a convenience fee and they have a limited selection to choose from. They didn’t have the Pizza Pirate, but they did have a different pizza place that was basically the same. There was more seating it seemed like, all around the marketplace. There was the marketplace, then nestled inside the marketplace was the Havana Bar. It added another layer into the dining area. We did try out the Shake Spot / JavaBlue Cafe area on this ship. Tanner gave their Amped-Up Strawberry spiked milkshake a try, and we had a huge piece of cheesecake, to share. They were both really good, but you do have to pay extra for this amenity. It was fun to have once, but we didn’t go back every day. We gave the piano bar a try for the first time this cruise and absolutely loved it! The piano was right in the middle of the bar and it offered a really great time. Our pianist was a hoot and it gave us a good alternative to the comedy shows. That was one of the downsides to this ship. The Punchliner Comedy club was difficult to get to, and was in a very small area. We didn’t make it to any of the shows due to the difficulty of finding it, then the limited seating. It was nestled back behind all the specialty restaurants, and you could only enter it from one side of the room, and trying to find the correct place to go was very difficult. But, as I said, the piano bar was a blast. And it was at the entrance to that corridor, so it was much easier to get to. One other downside for me, that isn’t ship specific but Carnival wide, is that I discovered the Lip Synce Battle is the same on every ship. It has the same finale songs as well as the same cruise director bit at the end. That was a disappointment for me, but it was still fun to see how the contestants made the whole experience their own. The Liquid Lounge was where all the playlist productions and ship events happened, then after hours it turns into the nightclub. I loved this lounge, the electric blues and the round booths on the floor. It has removable chairs on the main floor to open into the dance floor. It was a beautiful lounge, and again, my favorite one so far. Otherwise, for the most part, this ship had the same things the other two Carnival ships had to offer as well. They all three had the Fun 2.0 upgrade, so it had Guy’s Burgers, which is one of Tanner’s very favorite features on Carnival. The MDR and the Lido deck are all the same with the Red Rum Bar and the Blue Iguana Tequila Bar. The atrium was beautiful with a huge sun hanging over the bar, but it has a pretty similar layout as the other ships I have been on. They had the fun shops and the casino as well as plenty of bars for everyone to get their drink on. Their corridors had some fun tropical images along the walls which added to the vacation feel. It was an absolutely beautiful ship and I cannot wait to sail on it again. Grand Turk was our second port in our seven day cruise. I had heard good things about Grand Turk, so we were looking forward to visiting. This was our second trip to the Bahamas. And while we haven’t been thrilled with the Bahamas thus far, Grand Turk was one of our favorite ports. We were greeted with purple clouds, some wind, and a bit of rain. However, by the time we were docked and ready to get off the ship, the rain had mostly passed. Because we got to port so early, they did not announce that we were cleared by customs and that it was safe to leave. So, as soon as we could, we headed out into the port. Today’s excursion was “A Taste of Grand Turk & Beach Getaway”. We made our way down the gangway to the meeting point for our tour. Luckily, we were on a small tour of only 10 of us. We waited a little while for our tour mates to wonder off the ship and meet us. We were then taken to a small van/bus thing. Since there were so few of us, there was plenty of space and lots of windows to look out of. We opened our windows and got ready to see the island. Our bus driver was very informative. He also was a good driver, which is not a guarantee on these kinds of trips. He took us by the Grand Turk Airport, where we saw a few planes take off. He showed us the salt ponds in between the roads on the island. From these ponds, Grand Turk used to be the world’s leading salt exporter. The United States has since taken over that title. Our driver showed us many of the churches and historical buildings on the island. Their architecture and their structures were all beautiful and well preserved. Our first stop on our tour was at the Historic Lighthouse of Grand Turk. You are welcome to sit on their porch free of charge, but it costs $3 cash, a person, to enter the grounds. It was nice to look off the cliffs and to read the signs on the grounds, but you get a good enough experience by staying out, if you don’t have the cash with you. There was a zipline that went right over this area as well, that was part of a different excursion though. While I have used the Chukka Ziplining company before, I would say that the zipline near the lighthouse looked a little underwhelming. But, we watched and waved as a few people whizzed by. The driver gave us a little while to look around and go through the small gift shop. After we had all had a chance to look around, we climbed back on board the van/bus to continue our tour. We went all over the island it seemed. It was nice to see their houses and what the island was like. We seemed to be in a higher elevation for a lot of the island. Because of the elevation, we were able to see the water all around the island. It was nice a dark blue all over. I will say that it is a pretty flat landscape in the sense that there are almost no trees around, it seemed. While the island was pretty and green, it was mostly low lying vegetation. The houses also don’t seem to be right on top of each other, which is always a plus in my book. After the lighthouse, we made our way to a little shopping market strip down by the beach. Here, the driver let us out for 30 minutes to shop and wander. This was a strip about 100 yards long that had multiple shops for you to stop in a buy souvenirs. They are pretty comparable to the shops in any other port, but there seemed to be more of a variety of handmade objects out here compared to in this specific port. There was also a very small restaurant snack bar. We ordered some conch fritters and a beer, and sat at their picnic table in the sand and enjoyed the beach. The conch fritters were okay, but I preferred the fritters I had in Freeport. When everyone was done shopping, we made our way to the next stop. For this stop, we were taken to Sunshine’s for a delicious homemade lunch. Oh my, it was amazing. We went in and we were instantly welcomed by the owner, Sunshine. She had a cute little restaurant full of beautiful fish decorations hanging from the ceiling. We went through the line and were served huge plates of pork ribs, bbq chicken, rice, beans, and fresh steamed veggies. And man do I mean huge plates. They were piled high and it was so dang good. This was all included in our tour. We sat and ate and enjoyed her amazing home cooking. A few locals filtered in and out as we were there too. The staff and Sunshine were so kind. They even cleaned our tables when we were finished. Sunshine’s even offered us Wifi, though it was a little weak when we were in there. We weren’t rushed, we were welcomed and enjoyed our food. After stuffing our faces full of wonderful food, it was time for our final stops. We were given the choice to get off at Jack’s Shack, or to be taken back to the port. We decided to get off at Jack’s Shack since this was a personal stop we were heading to anyways. Jack’s Shack is a bar right on the beach with the infamous dog Topher roaming around to play. We walked out to the beach and claimed some beach chairs and settled in for a bit. Now, Topher was all I had been hearing about since discovering him on Instagram. He was the highlight of Jack’s Shack and he has quite the following. We played with the dog, enjoyed the bright blue waters and soaked up some sun. We had most of the afternoon to spend here. After a fun and relaxing afternoon we headed back to the ship. Now, the bus that brought us here was offering a shuttle service back to the port every 30 minutes, but we were only about half a mile down the beach from the ship, and could see the ship from Jack’s Shack, so we decided to walk back to the ship. We walked right up to the port and entered through Margaretaville. There in Margaretaville was a pool and music and a big party going on. We decided to drop our stuff back at the ship and change, then wondered back to the port to do some shopping. Beware here, because a lot of these shops were cash only, but did not have any signs saying so until you were checking out. Make sure to bring cash if you are looking to make any purchases. I did find quite a few goodies for myself and family back home. We spent just a little more time in port then headed back to the ship. We sailed away from Grand Turk while eating dessert in the liddo marketplace. Half Moon Cay is a beautiful private island that Carnival sails to and we just had the chance to stop in and spend the day. Though the hurricanes recently went through the area, you wouldn’t be able to tell on this small island of paradise. Now, I didn’t quite know what to expect when heading to Half Moon Cay. I knew that it was a small, private island. And I was sure it would be beautiful. But it wasn’t explained to me, even once we were on the ship, what exactly sailing to a private island would entail. I later found out that Carnival basically moves the whole ship to the shore. That’s right, the crew, the food, the music and the fun. Half Moon Cay is a tender port, so all those luggage carts that load our luggage also bring the ship to shore. Everything we would need loads up on those tender boats. The tender boats can hold a couple hundred people and they were running two at a time. You start the day with getting tender tickets. Then, as your zone is called, you head down to the gangway to tender over. The tender is very short, maybe 5 minutes. Once docked on the island, you are welcomed into a port, similar to most others. They have a few cash only shops, then you are kind of just left to your own devices. Once we were on the island, everyone just disperses. There are nice brick walkways that don’t seem to lead anywhere but to more beach area. They were lined with lush greenery and palm trees. They had multiple bath houses that were very nice and clean. We eventually picked some chairs close to the water to set up camp. Slowly the whole ship emptied out on to the beautiful white sandy beach. Hundreds of chairs lined the glass clear water. There were these blue tent like covers that you could rent to cover your chair. They also have floats that you can rent, all using your sail and sign cards. The green mat type floats sold quickly, then you were offered a yellow innertube. I believe we paid $20 to rent it for the day, but you could easily bring your own to relax in the water. And what about the water? It was beautiful! It had such an amazing blue color and you could see straight down to the bottom. It was definitely a little cold when you first get in, but it was wonderful once you got used to it. The water does start getting deep pretty quickly, but that is where the float came in handy. It was so nice to just lounge in the water and soak up some rays. While the water was beautiful and clear, there wasn’t much to see right off the shore. It was not a good snorkeling destination. Around lunch time, we decided it was time to search for some food. We saw others with plates full of food, so we started our hunt. This was one of the things that wasn’t made very clear to us. They brought a whole buffet out onto the island! And the best part was that it was completely free. That’s right, lunch included compliments of the carnival cruise ship. After a little wondering through the vast sets of pathways and past a bunch of patios with picnic table on them, at last we reached the food pavilion. And just like on the liddo buffet, you get in line and start making your way through. They were grilling up hotdogs and hamburgers. They had all the fixins to go with it as well as sides for you. They had veggies and potato salad. They even had a dessert area! Now, I never found it, but I saw others had cheese for their burgers. Haha They had crew members bussing the tables and they even had the water and lemonade available in a soda dispenser. Now, the one thing we discovered was that the drink packages do not work on the shore. You had a limited selection of soda and alcohol available and it all could be paid for with your sail and sign card, but you still had to pay. A little after lunch, the Fun Squad showed up and brought some Liddo Deck fun to the beach. There was a big pirate ship, with a bar inside, that was the meeting point for the fun and games. And games they delivered. Lots of fun to watch just like on board. They had the DJ out there and eventually even our Cruise Director showed up. We did notice that the music wasn’t heard very well past the pirate ship area though. Along with the hundreds of chairs that lined the beach, were also cabanas for rent. They were cute little house looking things that you could pay for, they had a table to sit at and offered a more comfortable, shady place to hang. They were very nice looking, but we were just fine out on the beach with most of the ship. Eventually, it was time to head back and reload the ship. They had us go through the metal detectors there on the shore before we boarded the tender boats, to help smooth the embarkation process. Back to the ship went all the guests, as well as the luggage carts attended by crew members. We even saw our head waiter on our tender as we returned. 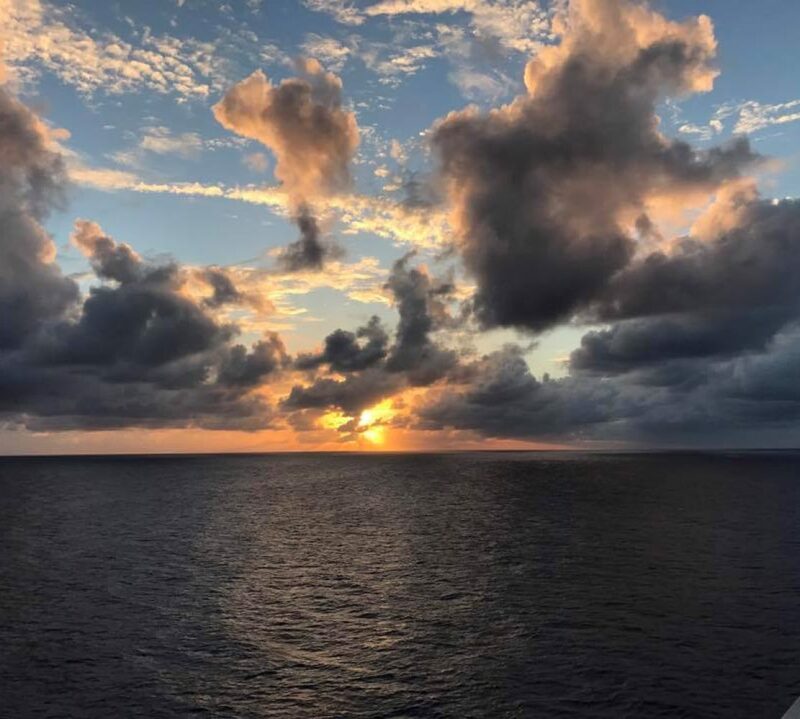 Once everyone was back on board, we were able to sail away to a beautiful sunset and a small little rainbow playing in the clouds. It was a perfect ending to a wonderful day in Paradise.